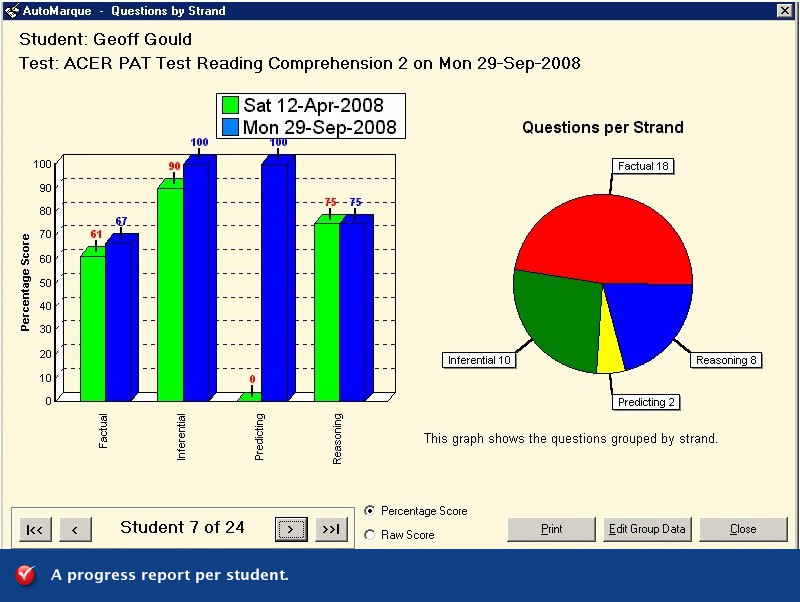 AutoMarque allows teachers to mark students’ paper based responses to written work, multiple choice questions and practical work, in less than two minutes, using their photocopier or portable sheet fed scanner connected to a computer. It's a world-first product to enhance the user’s awareness of the quality of their pedagogy and student learning. It is also an outstanding productivity tool that completes assessment in minutes - a process that used to take hours. 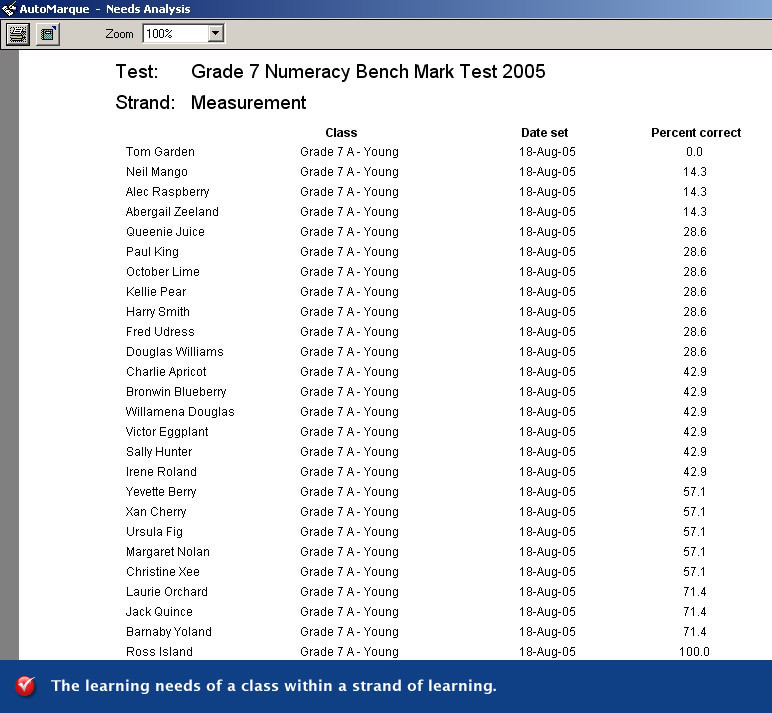 AutoMarque enables teachers to quickly obtain an insight into the quality of their teaching effectiveness. This allows them to focus directly on the needs of the class. Research shows there are many highly qualified teachers who are gifted in their particular subject area. However, they lack a way of getting quantifiable feedback on the quality of their teaching. Now, AutoMarque provides them with this feedback, giving them a new lease on life. If the teacher wants to obtain an overview of those students with similar learning difficulties, AutoMarque’s needs analysis shows this. Instead of the traditional practice of revising the whole test, teachers are now able to define areas of weakness of learning in the whole class and concentrate their teaching on the classes’ specific needs. 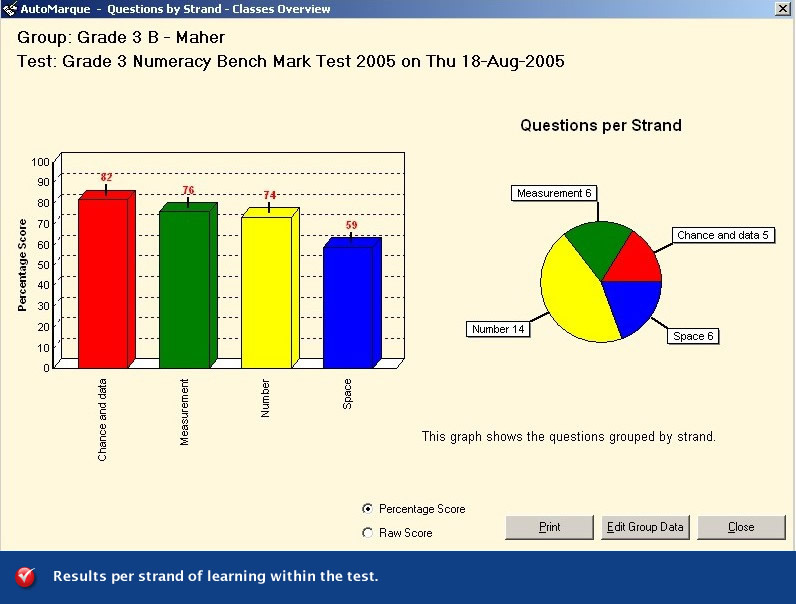 Individual student results, by strand of learning, can be compared with their peer group. These are obtained on the click of a mouse. This provides a powerful insight into an individual student’s needs. 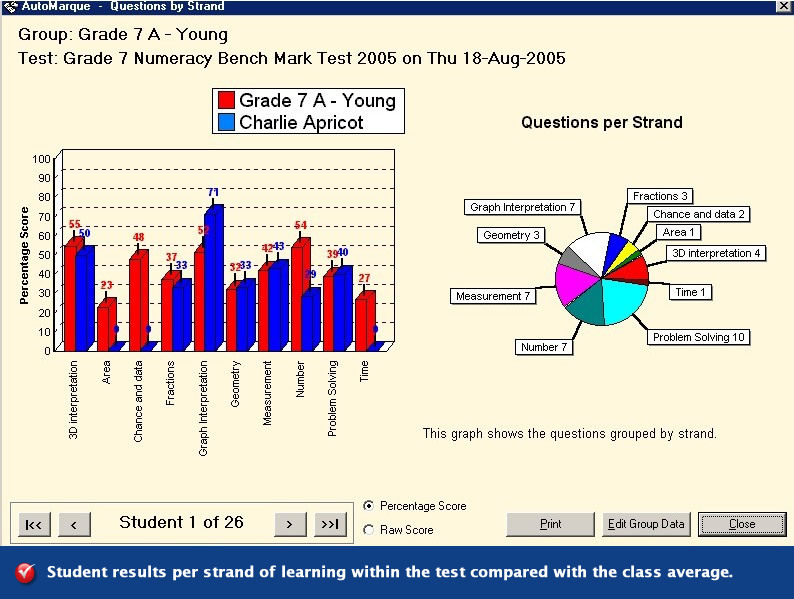 AutoMarque’s student strand analysis result sheet is vital when counselling the students parents and supervisors about specific intervention. As AutoMarque stores test results, a history of student achievement is quickly retrievable and student progress is easily and clearly demonstrated. 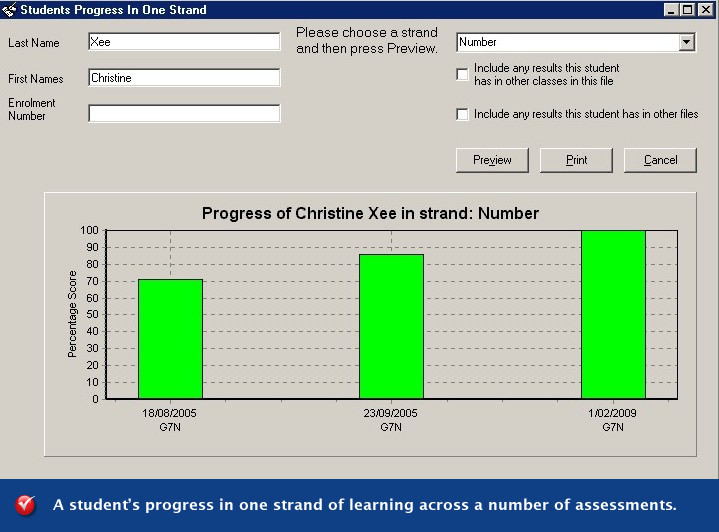 Student progress report. These are ideal for coaching each student. 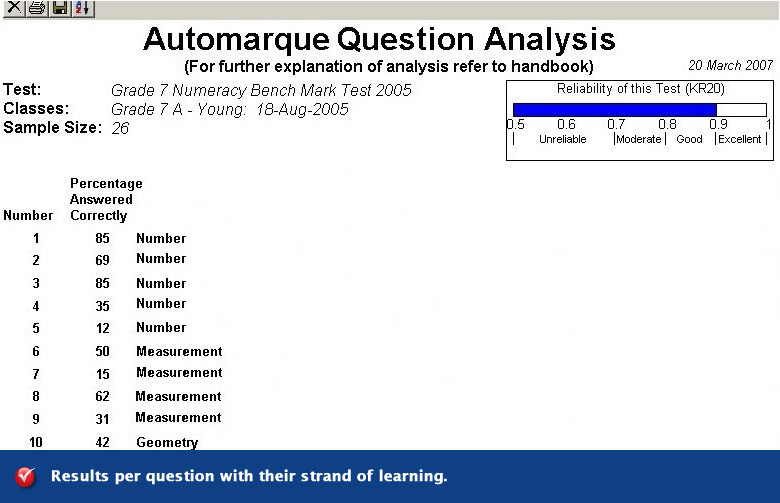 If the teacher wants to obtain an overview of those students with similar learning difficulties, AutoMarque’s needs analysis shows this. 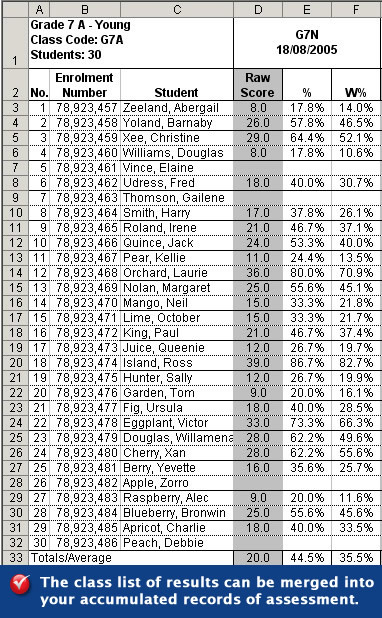 It ranks students from the least successful to the most successful in a designated strand. 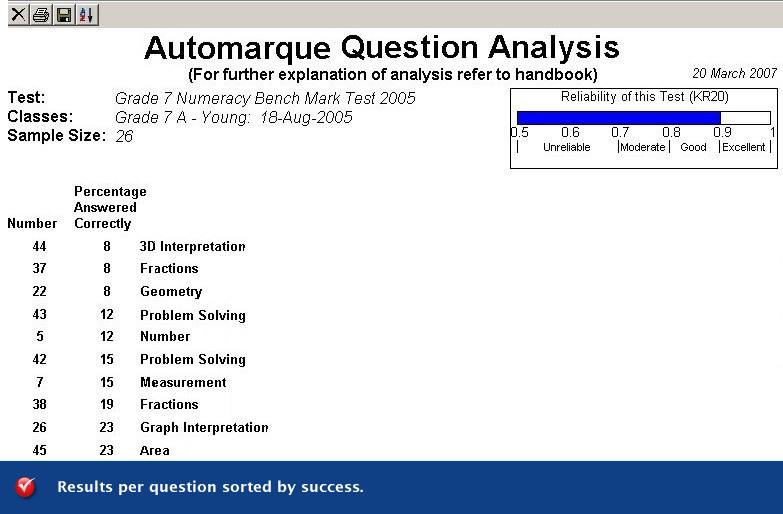 AutoMarque enables the ranking of a series of classes within a school, based on a single strand of learning. This means students with similar needs can be easily grouped for added assistance. One of the ongoing difficulties with assessment is that questions are not necessarily of equal value. AutoMarque has overcome this by producing student results in three forms; Raw score, weighted percentage and none weighted percentage.